The newspaper coverage today of Blair in Africa is enough to make the blood boil. Why should this man be ferried round the world at taxpayers expense so he can be serenaded and feted? The way we have developed our democratic system over the centuries is supposed to mitigate against this. Lose and election and you are out the next morning. Lose a leadership challenge and you are out the next day . It is typical of New Labour that in their constitutional vandalism they have even manged to effect change in this area. Meanwhile, back in the real world interest rates are set to rise, energy prices are rising again and the housing market may finally be beginning to slow. Even less reason to watch the TV; more time for blogging. Whilst travelling I thought a little reading with the enemy was in order and only took abroad tomes written by unreconstructed lefites. A couple were truly poo but one that I actually enjoyed was Noam Chomsky's Failed States. Noam is of course, near mad. A world class master of seeing evil in good and vice versa. Capable of Tony Benn catastrophic misjudgements. He shares some things in common too with Gordon Brown; such as his epic struggle against common sense. Nonetheless he does write well and also makes good efforts to quote from sources, dubious so some are. Overall his attitude to US and UK imperialism is consistent and blind. Hezbollah and Fatah are the good guys, Ahmedinnerjacket a true man. Hugo Chavez does no wrong. Instead all the enemies are to be found at home and his world is a conspiracy of evil. Despite this, his analysis of the Israel/Palestinian conflict is worth a read as it does show another side to conflict that does not come across in the media; even if I don't agree with him , it is instructive. The best bit is in his analysis of domestic priorities; healthcare and most other services are left in the hands of the state. Why you ask? Because the private sector creates damaging bureaucracy and middle-management that wastes resources. Thanks to Mr. Drew for keeping this place ship-shape during my absence. I trust you have all enjoyed his postings. I thought they were so good that Mr Drew will be posting here more frequently in the future. As for me, well I have had a pleasant trip away and am now back in the UK again. As usual, I could not help myself whilst abroad from speaking to all and sundry about the political and economic make up of the country. I managed a few conversations with taxi drivers, a lunch with some hotel owners and a dinner with a banker to gather my information. The beautiful country that is Mauritius, a former UK colony until 1968, has had a pleasant history until hitting the buffers more recently. They have a stable democratic government but turned 2 years ago to Labour to see if they could improve the country. What has gone wrong? Well firstly the WTO rulings on sugar, just like Caribbean Islands that I have blogged about before, have hit Mauritius hard. 45% of their exports are sugar and the price has collapsed, this has ruined small farmers and families who have had to sell up to more mechanised conglomerates, thereby increasing the unemployment rate to over 10%. Secondly, the foresight of the government in the 80's led to the growth of a large textiles industry, but sadly this has been crippled in recent years as wages grew and owners decided to move off to India and China. interestingly the tax breaks that were given to allow the development of the industry were removed and this seems to have been a key cause of the owners upping sticks. This leaves just the tourist industry as the main source of growth, with many fine hotels springing up over the country. Many graduates work in this sector, even though they are just waiters and cooks. Quite a waste really and still relatively low paid even by local standards. Despite all the hardship, of which there is alot, there is no civil unrest and the people are a pleasantly laid back bunch. The island now though is experiencing some quite large net emigration each year. Labour is still fission for answers on energy: this, from the Sunday Telegraph, is the best write-up of the Energy White Paper I’ve seen. Doesn’t make for optimistic reading. And the pun's pretty bad, too. Ten executives face long arm of US justice: now here’s another candidate for my list of clever things Cameron could promise that don’t cost much but would go down very well – some symmetry in our extradition arrangements with the USA, please. Bids, deals and trading drives UK's wealth: the Sunday Times reports that output of the financial sector expanded by 4.7 per cent in the first quarter while manufacturing fell 0.3 per cent. The Government has moved its goalposts on CO2 emissions targets, says the Independent on Sunday. Yes indeed: several times ! and I'm sure McBroon will continue this fine Blairite tradition. PS: don’t bother to read the Inde piece today on Gazprom’s activities in the UK: I know several readers of this blog are concerned about Russia’s move on our energy markets, but this article is riddled with factual inaccuracy and is not the place to learn anything at all. Next weekend – the Slicker will be back and normal service will be resumed! BBC Business Coverage "Failing Impartiality Test"
You wouldn't have guessed this. an interview with Bill Gates was "sycophantic in tone"
interviews with Stuart Rose, CEO of M&S, were "too uncritical"
The question arises, where is the financial reporting to be found that isn't too uncritical? Fleet Street's finest are hardly famous for it. You'll wait a long time for a scandal to be broken in any mainstream paper - honourable mention to the occasional piece The Economist. Otherwise, we wait for Slicker's column (no relation)(so far as I know) in Private Eye. The difference, I suppose, is that Fleet Street is cowed into sycophancy by dependency on advertising revenues: the Beeb should be above such considerations. If it can't rise to the occasion from this privileged position, what's the point of financial independence? I must crave the indulgence of Slicker and his finance-oriented readership, for straying so far from the business theme whilst temporarily at the wheel of this vehicle. However, I was mightily stung by a report on Channel 4 News tonight. To summarise: the British Army, having employed the services of many Iraqi translators (and, let's face it, 'little helpers' of several kinds) since the invasion, is now preparing to let them twist in the wind. And they'll be the lucky ones. The threats and reprisals have started already. Now this is by no means unprecedented: previous withdrawals in unseemly haste from Palestine, Aden and Cyprus resulted in horrible fates for those locals who had helped us there. But the British Army had learned its lesson and when, in the days of the much maligned John Major we prepared to withdraw from Hong Kong, we carefully looked out for the interests of our sometime helpers to ensure that the worst didn't befall them at the hands of the incoming regime. Well would you believe it? On the very day that yet another Energy White Paper hits the DTI website, BP announces it won't be going ahead with its much-vaunted plan for a carbon-capture-and-storage (CCS) project for a coal-fired power station in Scotland. The ostensible reason is that the government won't be deciding something-or-other (perhaps it hasn't made up its mind whether it likes the sound of clean-coal electricity?) until November. Not good enough, says BP. What a dreadful coincidence of timing: and there was us thinking that BP was wired into NuLab - Anji Hunter and all that. Is it just that, as any fule kno, CCS is grotesquely uneconomic? Or do we detect a bit of the legendary BP brinkmanship here? McBroon has to be shown he can't take BP for granted? What a happy honeymoon this is turning out to be for Wee Gordo. And what a good job John Browne already has his peerage, eh? Hello, Boys ! - Turkey Ready to Join EU ? One needs to think carefully before agreeing with the French, but when it comes to the vexed question of whether Turkey is ready to join the EU, they may have a point. "The photographs were not up to EU standards and could cause car accidents"
Do they understand nothing? A bikini ad meeting EU standards is guaranteed to cause car accidents, and indeed a whole range of minor industrial and domestic mishaps. What will they think when they are forced to import French body-lotion posters? Clearly, they have a cultural mountain to climb. Here’s something linking business and politics. It’s a commonplace observation that McBroon is indulging in ‘Enron Economics’ on a large scale, what with PFI and all. I know a bit about Enron (*coughs*). Au fond, Enron went bust for the oldest reason of all: it was growing rapidly and its profits ran way ahead of its cashflow. The usual ways to avoid being dragged under by this are (a) forgoing growth (yeah, right) and (b) borrowing. But for Enron to borrow openly would have meant losing Investment Grade status – and with it, the ability to transact its most profitable deals. So it turned to ‘off-balance-sheet’ devices. Initially these were mostly quite clever (*coughs again*) and legitimate securitisations: but the appetite was insatiable and eventually it all collapsed in circumstances of criminal farce. Turning to Wee Gordo’s use of Enron Economics, I have these questions for those who understand such things. 2. how and when, exactly, is it all going to come unstuck? Let’s see how far we can get with this knotty exam question before the Slicker himself returns and puts us right. Do not attempt to write on both sides of the paper at once. Barclays seeks regulators' nod for ABN Amro bid: the takeover saga may be entering its closing stages. As usual, though, the papers miss the real story. To clinch this deal, Barclays is offering to move its HQ to Holland, but my regulatory spies tell me that the Dutch will refuse to act as ‘banker of last resort’ for the whole group. So – will the Bank of England ? Over to you, McBroon. Police hunt arms trail in Downing Street: they are looking for e-mails sent by and to Jonathan Powell, Tony Blair’s chief of staff, suspecting that BAe adviser Lord Powell, his brother, was lobbying Downing Street aides to have the investigation stopped. As we asked last week, did Blair really think he’d killed this one? Darling faces up to a nuclear tomorrow: although he was anti-nuclear 20 years ago, little Alistair “is now in favour of it as part of the mix”. He’s also in favour of keeping in with nuc-backer McBroon. So it’s a very fortunate coincidence that he’s changed his mind. British Energy, which is starting to recruit for the anticipated bonanza, will be delighted. Ministers will block Gazprom move on UK: "Whitehall officials have indicated that ministers have reserve powers that could block a takeover." And just to emphasize the point: Russians ready to seize back BP's Siberian gas reserves. Well, last year they shafted Shell, Exxon, Chevron, ConocoPhillips, Total, Marathon, Statoil and Norsk Hydro – so why not BP? John Browne was naïve in more ways than one. Politics this morning, with at best a tenuous link to business. This is David Winnick (Lab, Walsall N): not the kind of MP I would normally have much time for, and I rather imagine that most readers of Slicker’s blog would feel the same way. He is an unreconstructed leftist; and he had the temerity to sit for Croydon South for a short time (as the result of a small accident in 1966) and was thus my MP. However, twice in one week he has conducted himself as a man of honour. Firstly, he declined to nominate McBroon, and will thus be able to wear proudly the Don’t Blame Me teeshirt in due course. Secondly, he voted against David Maclean's shameful Freedom of Information (Amendment) Bill. His speech in the Commons yesterday was heartfelt and right on point. By contrast, the current MP for what is effectively the same Croydon constituency Andrew Pelling (Con, Croydon Central), voted for this disgraceful Bill. I do not know why. David Winnick, honourable old leftie, I salute you. To round off the week . . .
"Few write as the architect builds, drawing up a plan beforehand and thinking it out down to the smallest details. Most write as they play dominoes: their sentences are linked together as dominoes are, one by one, in part deliberately, in part by chance." Wonder who he had in mind? Slicker, Newmania and all the ex-City types (Guido, Tuscan Tony, the Hitch et al), bandy around their esoteric financial jargon, frequently leaving mere mortals clutching at thin air. But help is at hand . . . It is a little known fact that the Drew was once FSA-registered himself – in his *ahem* Enron days, when some of the more imaginative deals we did were without doubt financial derivatives. While the Slicker’s back is turned I am therefore able to give you this guide to what all those mysterious terms mean . . .
Straddle - Makes you wonder what they get up to, doesn’t it ? The Centre for Competition Policy at the UEA has found that half of the population have never switched gas/electricity suppliers, and are paying more than they need to accordingly. Further, even some that have switched have done so for the wrong reasons so that they, too, are paying over the odds. Their report is here. And we've had full consumer choice in gas and electricity for ten years now, one of the great achievements of John Major's much-maligned government. On the plus side of this sorry but somehow inevitable story is the well-known economic phenomenon that you only need competition at the margins for at least some benefits to be felt across the market as a whole. In this case, we can be fairly sure that prices for even the inert 50% are somewhat lower than they would have been without the competitive market framework. On the negative side, we can be equally confident that those who can least afford to pay over the odds will feature disproportionately amongst this 50%. To them that hath, shall be given. And from them that hath not, even that which they have shall be taken away. If McBroon is to enjoy even a honeymoon-period of favourable press coverage, surely his best hope is the Grauniad? Well, no: its two heavyweight political cartoonists have clearly decided otherwise. Steve Bell portrays him today in a soiled nappy (at least John Major's underpants were always clean in Bell's cartoons): and Martin Rowson captions McBroon's hideous visage with "Run for the hills!" Standards of deference are pretty low these days, but in a Gruaniad context this is outright lese-majesty. McBroon is known to brood over newpaper coverage, and these things will gnaw at his entrails. Knowing of old that regular visitors to this page don't tend to be patrons of that paper, the link to Rowson is here, and to Bell here (if you like soiled nappies). "The first rule, indeed by itself virtually a sufficient condition for good style, is to have something to say"
The Observer reports on fallout from the BAe affair, continuing to dog the company despite Blair’s disgraceful efforts to hush the whole thing up. Execs of its US affiliate are likely to face questioning by powerful Congressional committees in Washington over the allegations that the company bribed foreign officials in pursuit of arms deals – just when it is hoping it can pull off a £2.1bn bid for the US Armor Group, maker of armour (sic) for the Humvee military vehicles. If Blair seriously thought he could draw a line unilaterally under this, he was being very badly advised (or operating in self-delusion mode). The international arms trade is a cut-throat business and his old mate Bush will cheerfully capitalise on the scandal. On its front page rather than in the Business section, the Sunday Telegraph reports that Hilary Benn holds a £233,000 stake in a company that does work for his Whitehall department - “a major blow to his political future”, they suggest, and “a significant problem for Mr Brown, who has pledged a new Ministerial Code”. The Sunday Times reports that the "highly controversial" Russian conglomerate Alfa Group has recruited a Tory ex-foreign secretary (Hurd); a former British ambassador to Moscow; a man credited with having helped to build one of Britain’s most high-profile companies; the former chief executive of a leading European telecoms equipment manufacturer; plus a couple of well-connected Washington insiders, to adorn their corporate letterhead. It seems likely that this weekend’s press coverage will be the high-water mark of goodwill for Gordon Brown: he will have spent several weeks briefing and spinning for the relatively benign coverage he has received. "Mr Brown is not much liked by the public or most of his fellow ministers." Mr Brown is off to a good start. By doggedness, machination, intimidation and persuasion Gordon Brown disposed of rivals and made his premiership inevitable. In this weekend’s supplement, Business and Politics looks at the pro and cons of offshore banking. 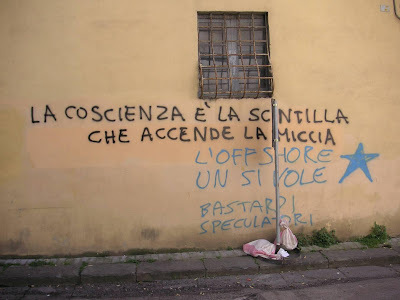 Our guest writer is the chap who hangs around the alleyway at the back of the Economics Faculty at the University of Pisa. Fortunately, several of the wise Teutons are very capable in the pith department (when they come up for air). “Comrades! In 1922 Lenin wrote: After taking over the position of general secretary, comrade Stalin accumulated immeasurable power in his hands and I am not certain whether he will always be able to use this power with the required care… I propose that the comrades consider the methods by which Stalin would be removed from this position and by which another man would be selected for it. OK you Labour MPs out there, you know it’s true, you’ve got 6 weeks, what are you going to do about it ? And it's goodnight from him....but hello from Mr Drew. So Tony Blair has said he will stand down at last. Can't say I am happy having seen his rather pathetic speech which the media are all over; bad as he is, Brown is worse. 'I did what I thought was right'. ..what sort of comment is that on 10 years of work? Anyone would surely say this about themselves apart from a total psychotic. I guess he reached this point as all his supposed achievements have nearly unwound themselves. On that note, interest rates have gone up another .25% today which is no great surprise given the dismal underlying economic state of the country. I am not a pessimist by nature, but the state of public finances is very poor considering we are at the top of the cycle in terms of economic growth. interest rates will top at at 6%, which is alot if you have 5x salary owing on your mortgage like a lot of people. What economy will Gordon Brown inherit? It is not he legacy that Major left for Blair, that is for sure. I am not pleased at all that Brown is to be PM; an awful man with poor judgement and quick to anger. None of these are qualities needed in a Prime Minister. Sadly I don't think he is stupid enough to go for a snap election. And with these comments, I am off for a break far away. He will no doubt do a better job than me in keeping you entertained for a couple of weeks. Had a bad day yesterday and ended up in hospital; home (and better ish) today but blogging will be light. So much for my sidebar prediction of Blair going on the 5th May; like most things, my powers of prediction are somewhat less than Cassandra's. Luckily for me no one took up my challenge; so at least I can drink the Champagne when Blair finally does exit stage right. So maybe he will announce something this week, maybe not. No more predictions' on this subject from me! Labour to re-nationalise the railways? - no surprise here, not they are set to lose the next election, they can play economic silly buggers. Tide turns to RBS in banking war - is this of much interest outside of the City though? Croydon Council move to a develop property - At last, some better ideas for developing the badly needed housing stock. BP post Lord Browne - An analysis of what the future holds for all you shareholders. Easyjet to the US - can low-cost carriers break the international market? ..and a look at the consumer credit crisis too - not pretty, I hope it is not you! Biofuels; The great green con - Top article, makes 2 valid points and then misses the winner that biofuels created more carbon emissions than fossil fuels! Article of the week - What will Brown do when he is crowned? - A nice summary of the various policy options we will soon hear more about. Having said that I have seen the news on and off all day. It has has made me choke to hear the Beeb say what a relative failure for the Tories today has been. 840+ seats to Labour -460? It also made me think about how odd 24 hour news reporting has become. Yesterday I clearly heard that 500+ seats would be a good victory for the Tories, by none other than Nick Robinson. So why the change today? They wanted a story this morning that is why. They had nothing to say when Scotland was too close to call, so 'the line' became Tory failure. Not Labour disaster or Lib Dem meltdown. Once this line had been taken it has been defended all day, even in the face of the facts of the election. Tp be fair, Sky have done more or less the same as well as the Beeb, this is a media production/manufacturing problem. It has come to a pretty pass when the media is defending its own commentary over reporting what is actually happening. May is always a busy time for football, much to Mrs Slicker's dismay. The Business that is football has been one of our UK success stories over the past few years. Since the inception of the Premier League in 1992 it has been an uninterrupted money making machine. Although some fans, especially the more traditional working class fans who can no longer afford to attend matches so regularly, despise the way the game has gone, there can be no arguments from a business view. 10 years ago the league was well behind Italy and Spain, good overseas players would tend only to come to England if there careers were nearing an end, players like Jurgen Klinsmann and Gianfranco Zola. Nowadays, the best in the world can't wait to get here because the money is so good. This money though, made from slick marketing and a good product on the pitch, has huge consequences. Just today, the Wigan chairman has threatened to sue the FA over not deducting points from West ham. He thinks it could cost his club up to £60 million, which is what an independent analysis said today. This is big money. Big enough that American sports billionaires are keen t get in on the action and this will ratchet up even further the money in the game and probably the profits generated for it. For all this though, the game has changed, unlike American sports where the leagues try to maintain parity, the opposite has happened in the UK. With the new extra money this is going to get worse, expect to see the same teams at the top forever, unless they do a Leeds! Also, minor apologies to all the new BlogPower members, I have added your links today. In particular would recommend Lord Nazh, Ruthie and Pommy. Lord Browne: Story of the day. It is rare that I am left speechless, as Newmania and Croydonian will attest to. However, the news that Lord Browne, former-greatest-CEO-ever-in-history, has resigned because of a gay love affair did indeed stun me. Not that I could care about this, but the fact that he has also led BP, after years of frankly brilliant service, to two high profile disasters is a sad denouement. Did this affair take his mind off the ball? Or did events just catch-up with him? Maybe he should have quit a couple of years ago when he was offered the chance. There was innocent me at the time thinking that this was a merely platonic statement of admiration...could I have been wrong?